Made significant progress on revising the proposal for my second YA novel. If it feels like I’ve been talking about this for roughly the last nine months…it’s because I have. Right now I am on my fifth proposal. Been getting closer and closer with each one. The last four have been revisions of the same concept, so it’s not like I’m starting from scratch each time. Still, I do find this to be a somewhat difficult way to work. I have learned a lot of about planning out stories, though, so I think it’s been a net gain. ALSO, I started reading Boswell’s Life of Johnson.This is an incredibly thick 1790s biography of the essayist and poet Samuel Johnson. It’s the classic biography in the English language (though I’d say Robert Caro’s Lives of Lyndon Johnson gives it a run for its money). So far it’s been much less tedious than one would think. Johnson was a fascinating figure, both lazy and brilliant at the same time, and very much taken with all sorts of strange causes and notions. The wording there–“obliging him to become a stranger”–is so fascinating. 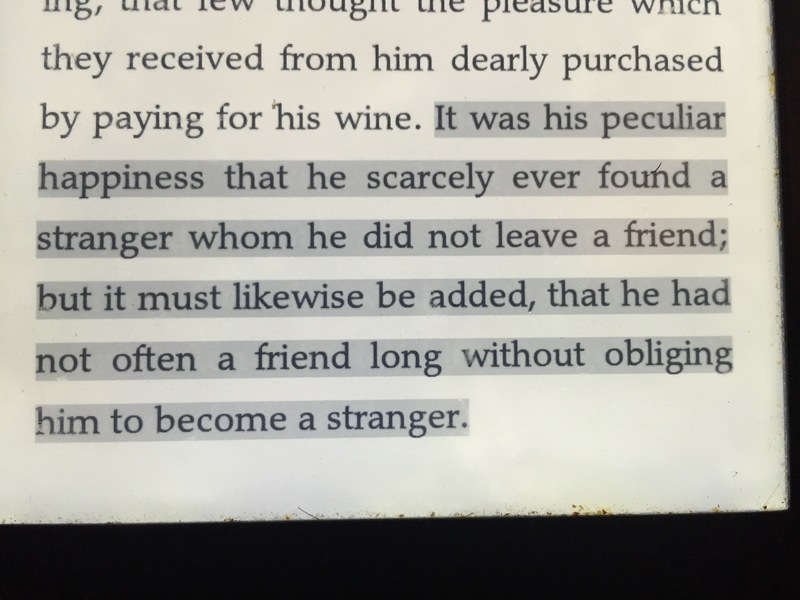 It would’ve been so easy to write “He scarcely ever found a stranger whom he did not leave a friend; but his friends often turned, after awhile, into strangers,” but the way Johnson wrote it just feels so much more precise–he “obliges” his friends to become strangers. It’s an idiosyncratic use of the word, but it works amazingly well. Are you reading the full version of the Life of Johnson or an abridged version? I read the full version and although there’s lots of great stuff, there’s also lots of inessential fluff — I ended up wishing I’d read an abridged version. Boswell’s journals are well worth reading. I have the one-volume edition edited by John Wain. The journals are full of Boswell’s adventures with prostitutes, attempts to meet famous people, and so on. Because they weren’t written for publication, they’re incredibly frank and vivid. I read the full version, and I definitely shouldn’t have. An abridged version would’ve been much better. I finally just ended up abridging it myself, by skimming it whenever they got to another letter-writing section. A version of the book that was JUST the parts where Boswell hung out with Johnson in London would’ve been sweet. I’ll check out the journals! They sound awesome!